So: This year you are going to host your own Passover seder! You’ve decided that this year it’s going to be at Your House. Alternatively, someone else has decided that this year it’s going to be at Your House. Either way, you are now feeling a mixture of excitement and dread, because this is the first time you’ve hosted. Here are seven tips for making your first seder one that you will remember with a smile, or maybe a laugh. 1. PARTNER, DIVIDE, and CONQUER! Your partner may be your spouse, your beloved, your roommate, your best friend, or the other Jew in your book group. The point is, you don’t want to do this alone. One of you is going to be in charge of food and the other in charge of setting the table and leading the seder. Don’t be fooled by the word “leader:” these two roles are co-equal and equally critical to success. During the first part of the seder, both of you will be busy. One of you will serve as Maestro/a of Ceremonies, making sure that things move along, that everyone participates, that everyone has a good time, etc. The Food Czar will be monitoring final developments in the kitchen, or monitoring the warming of potluck dishes, or making sure the cat stays out of the kugel, while supervising the movement of greens, salt water, wine, grape juice, and other necessities. 2. CHOOSE a HAGGADAH. 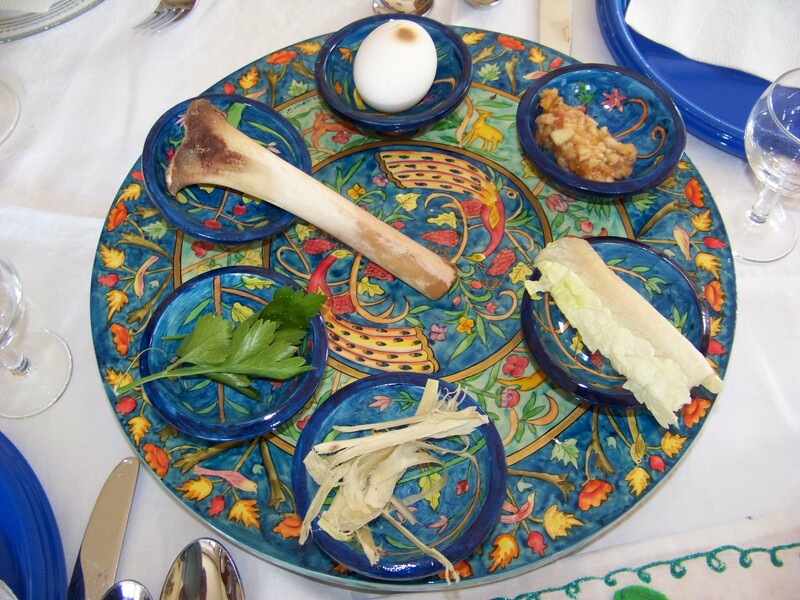 Your first seder is not the time to roll your own Haggadah (that’s next year.) You need at least one Haggadah for every two participants, and really, each guest having their own is best. This is one reason the Maxwell House Haggadah and other free ones are so popular. The Maestro/a of Ceremonies should read the Haggadah well ahead of the actual seder, cover to cover. Consider possibilities: if you find, mid-evening, that you need to skip, where do you intend to shorten things? Are there other readings or stories or games you have experienced at other seders you’d like to include? If you are adding things to your seder, make sure to have as many copies as you need. 3. PLAN YOUR GUEST LIST. Yes, I know that your Great Aunt Sadie always had at least 50 people at her seders. Trust me, she started small too. In my experience, a minyan [10 people] is a nice maximum for a first seder. Think about dishes. Think about where everyone will sit. Think about whether you can cook for this number, or if you will be potluck. Think about the ratio of seder “veterans” to newbies. A minyan of people who have never been to a seder trying to have a seder is adventurous but might result in 40 years lost looking for the afikomen, or even trying to figure out what the afikomen is. Note: if you have inherited the family seder, and like it or not you will have 50 people in your home for your first time seder, grab the relative with whom you feel the most comfortable and level with him or her about exactly how freaked-out you are. Ask for help. Humbly accept help. Keep reading this list, there is still stuff here that will be useful to you. 4. PLAN THE MENU. Rabbi Noam Zion, in his wonderful book, A Night To Remember, pointed out than in the ancient seder, no one sat starving for hours while we told the story. The scrap of soggy parsley you had at seder years ago could also be a bountiful plate of crudités with dip for everyone to nosh [snack] on while you tell the story and talk about what it means. Keep the parsley on the seder plate, and have a nice plate of celery, endive, and other crunchy goodies for everyone — then you won’t need a salad for the meal. As for the meal itself, let the Food Czar decide what he or she wants to wrangle and how. Whatever you choose, avoid foods that require last minute fussing. Note: Not all of your guests may be of the same mind about what constitutes kosher-for-Passover food. Check in with any guest you expect will have a strong opinion on the subject, so that you can plan for everyone’s comfort. If the meal is potluck, make sure that guests who may not know anything about Passover food are assigned something specific, lest they show up with home baked bread or some other labor-intensive inappropriate food. Hospitality is a Jewish value, and embarrassing a guest is a Jewish sin. 6. PREPARE THE WINE. The seder is planned around four cups of wine. Even if you are absolutely certain that everyone at the table will be over 18 and is not a recovering alcoholic, have a bottle of grape juice handy. No one should have to drink a glass of alcohol after they feel they’ve had enough. By the same token, make sure your table setting includes water glasses and water. Sweet kosher wine is a love/hate thing: some love it, some hate it. I put both Manischewitz and a “nicer” kosher for Passover wine on my table, to accomodate both. The Maestro/a of Ceremonies might want to have a joke about the Red Sea ready for the almost-inevitable spilled glass of something. 7. REMEMBER, THERE IS ALWAYS NEXT YEAR. The purpose of the seder is to tell the story of freedom in a way that will make it a part of everyone around the table. It is a shared experience that will build memories for the group at the table. Have fun with it. Some of the best seders I’ve been to involved spilled wine, crumbs everywhere, a burnt side dish, and a lot of laughter. If you skip something in the haggadah, or you forget a dish, or the dessert melts, it isn’t the end of the world. After all, every year at the close of the evening, we remind ourselves that Passover will come again next year. What advice do you have for someone hosting a first seder? You are welcome to share my blog with anyone. Thank you for reading! Horseradish by another name . . .Wasabi!Got some koeshr l’pesach one year, but it didn’t do ti for me. I had a rabbinic friend who thought we should eat enough horseradish to really know what slavery was like, so last year I took a chunk about an inch long and the same in diameter. WHEN I AWOKE . . . my daughters made me promise never to do that again.This year’s bitter herb will be romaine lettuce, a perfectly good substitute.As far as the onion, aren’t you adding something to the seder that’s not really supposed to be there? We’re not supposed to be adding or subtracting from the ritual, which is why some people have a second or third seder – the “political” one.Yakov, may your grinding be fulfilling and meaningful.Ariel, find the joy of the seder without the onion – save that for the second seder.Joseph, I read that book and he’s right.Sarah Leah, think of me when you bite down on that fresh shmurah – my fav!Chag Sameach! Wasabi is a great idea for maror [bitter herb]. As with any very hot item, I’d be sure to let everyone know that it’s extra-hot, not the usual horseradish from the jar. I’m a new vegetarian myself, Rob, and the Beet works well for me. I will check out that haggadah!